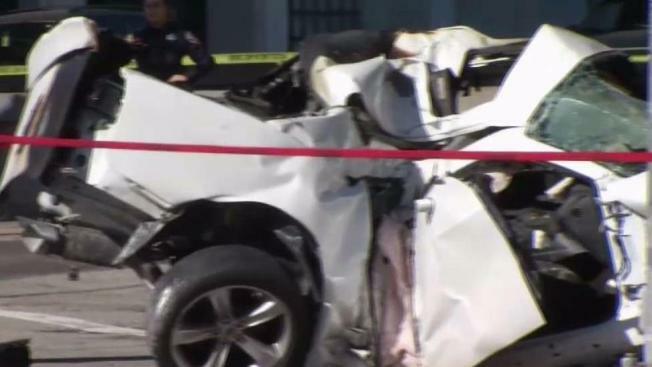 A woman died Sunday evening after the car she was riding in crashed and caught fire following a high-speed chase out of San Francisco that was connected with a kidnapping, according to police. The crash occurred at the intersection of West MacArthur Boulevard and Peralta Street, near the Oakland-Emeryville border, police said. San Francisco police had been chasing a white vehicle believed to be stolen and involved with a reported kidnapping, and that vehicle collided with the front of a silver Chrysler, then spun and hit a streetlight pole before coming to rest and catching fire, police said. Police and passersby were able to get the male driver out of the vehicle, but not the female passenger, who was identified as 40-year-old Daphne Bailey, police said. The driver was in critical condition at a hospital. The incident started with an assault on Leavenworth Street in San Francisco just before 3 p.m., after which Bailey, and a man forced another woman into the trunk of a car, police said. Officers responded and chased the vehicle across the Bay Bridge, and the pursuit ended with the crash in Emeryville. The woman who had been in the trunk of the vehicle was able to escape using an emergency lever from inside, police said. The Emeryville intersection would be blocked for hours as the crash was investigated, and police were asking the public to avoid the area.